The first time I did my own show in Edinburgh was 2009 and the first show happened the day after a particularly gruesome break up that features heavily in this years show. Up until this point, I’ve remained under the radar doing shows at the Laughing Horse Free Festival, which has been great for working on my craft and putting pennies in my pocket, but this year I have my sights set on bigger goals. I have a big show, and I want it to go to big places (all this use of “big” is starting to make me think I’m overcompensating too). I’m unbelievably excited to be working with the Underbelly. That’s a tough one, I’ve sold out shows in the UK, Australia, Singapore, The Philippines & Thailand. But the biggest thing that’s happened to me is either the realisation that brought me to the idea for the show, or the fact last week I decided to walk the West Highland Way for three different charities, ROHHAD Association, Epilepsy Scotland & MND Scotland, and raised nearly £2000 by walking 96 miles. Not quite the same as The Proclaimers song. I like to tell people it’s because my life is so much fun and I wanted to give back to something I believed in, but the truth of the matter is that I turn 40 at the end of July and I think it was a little bit of a mid-life crisis. The show is all about my disastrous love life and how the dating world has changed dramatically in the last decade. With a healthy dose of self reflection it also delves in to why I’ve been single for 9 years, and what I’m doing to change that. It’s honest, heartfelt and the funniest thing I’ve ever written. It’s been produced by Natalie Allison who is the only person I’ve ever met who can make me even more excited about my own projects. She’s been invaluable in helping me take all my brain babies and helping nurture them in to mature funnies. My aim is to take it to as many international fringe and comedy festivals I can find around the world. I have my heart set on a European tour in autumn/winter, then Australia in January till April, New Zealand then hopefully Canada, America, South Africa and anywhere else that wants to hear my tales. 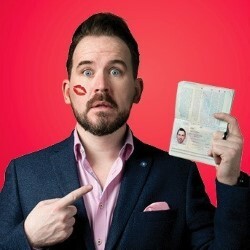 Ray Bradshaw is bringing his show ‘Comedy Def Fam’ back for a limited run, if you missed it last year definitely check that out as it’s my favourite thing I’ve ever seen at a Fringe. Others you should definitely check out are Stephen Bailey, Ashley Storrie, Chris Forbes, Fannys @ Five, Janey Godley, The Master that is Stephen Buchanan, Jesus L’Oreal Nailed It – there is a massive list that I’d recommend. I always put a full list of recommendations up on my website or Facebook just before the Fringe starts. Two top tips for choosing shows. Stop and speak to flyerers, ask them which shows they’d recommend other than the one they are selling, do that a few times and you’ll hear some names getting repeated which is always a good sign. Also, don’t go to any show that has more than one A at the start of the title, they’ve done this to get to the start of the brochure and if that’s as good as their imagination for the title gets, there isn’t much hope for the show.